Postage cost within in Australia is $9.95 per order, this includes multiple item orders. Orders are sent by Australia Post with tracking and require a signature upon delivery. Your tracking updates will be emailed to you once your order has been shipped. If you do not receive updates, check your junk mail before contacting us. Should no-one be at the nominated delivery address when Australia Post attempt to deliver, the parcel will then return to the local post office. Australia Post should leave a card in the letter box to notify the recipient that there is a parcel waiting for collection. These details will also be emailed to the your email address. Postage cost for New Zealand customers is A$15.00 per order, this includes multiple item orders. Postage cost for International customers is A$25.00, this includes multiple item orders. International orders are sent by Standard Airmail Australia Post which includes tracking via email notifications. 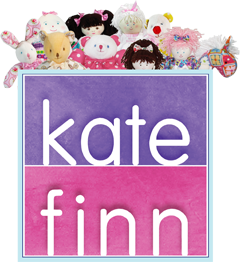 **Kate Finn is not aware or responsible for any duty or customs fees that may be charged by International destinations. Orders are shipped within 2 days unless disrupted by public holidays. **Delivery Delay – Our office and warehouse will be closed for a short break. Orders placed from Wednesday the 6th of March 2019 will be shipped from Thursday the 14th of March 2019.